We hear the bamboo before we see it. In the dark theatre, bamboo stalks are tapped and brushed on the stage. As the lights come up, long bamboo swings from the ceiling. In tight, feathered costumes (by Ninon Parent), the dancers slowly emerge and begin lunging and crawling among the bamboo, careful not to displace it. The pace quickens as all six dancers move in unison, forming human chains as they hold hands or each other’s feet. Just as bamboo seems to have no limit but the sky, these dancers were not held back by gravity. Using the entire stage and the air above it, choreographer Julia Taffe, has brought Aeriosa into the theatre for the first time in many years after focusing on outdoor site-specific works. Taffe, a recent recipient of the Isadora Award for Excellence in Dance, was inspired by bamboo structures she saw in Hong Kong. 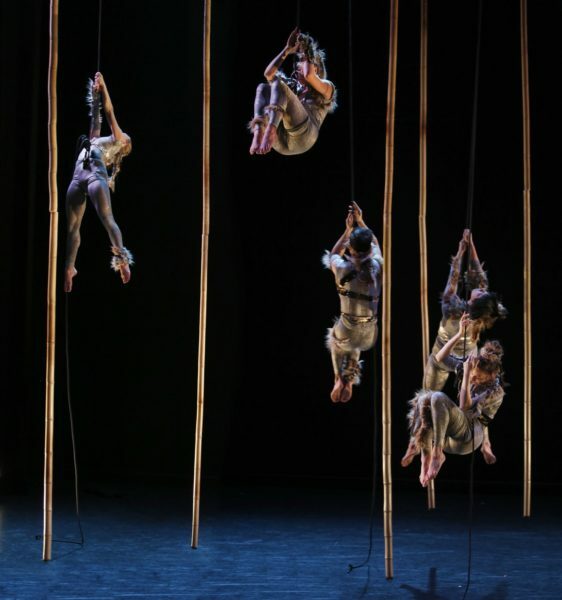 Bamboo and the high-flying vertical dance of Aeriosa complement each other very well, and the theme grounds the work while the dancers soar, spin, and dive above the stage. The gravity-defying, acrobatic feats of these dancers are not only extremely impressive, but they are also beautiful as Taffe has created stunning patterns and formations for the dancers in the air. At one point they all hold on to each other’s feet to form a perfect circle, at another they stand on each other’s shoulders to create a tall creature. Alex Tam, the only male performer, has an impressive acrobatic solo where he holds on to a bamboo stalk and dives from one side of the stage to the other. Not so much a set piece, but more of a character itself, the bamboo (designed by Dan Law) is incorporated seamlessly into the movements. At times used to propel the dancers or connect them, the bamboo was a constant presence that gave the piece a tranquil tone, along with the sound composition of Jordan Nobles and lighting of James Proudfoot and Jonathan Kim. Impressive acrobatics, beautiful artistry, and a cohesive theme make Second Nature a brilliant work of contemporary art. I hope Aeriosa ventures into the theatre again soon, but in the meantime I’m sure we’ll soon find them in swinging in the trees or dancing on the side of a building.